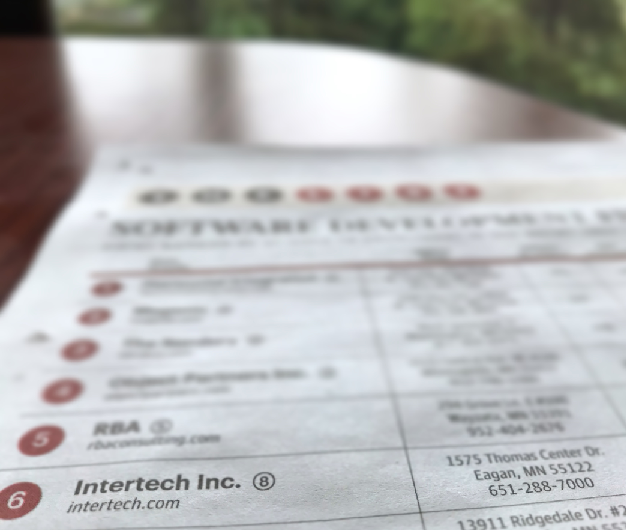 Intertech landed the #6 slot on the 25 Largest Software Development firms in Minnesota. My thanks to our loyal customers and extraordinary employees for making us possible. I’m excited to announce the Intertech Development Center. Read about it and how we’re creating a “sub culture” at Intertech in my Business Journal article How to cultivate a work culture that works for everyone. In that spirit, Intertech’s leadership team read the book “Traction: Get a Grip on Your Business” by Gino Wickman. We were intrigued by Wickman’s Entrepreneurial Operating System (EOS), which addresses the six most fundamental aspect of any business: vision, data, process, traction, issues and people. In addition to his book, Wickman runs a business helping organizations implement his EOS principles. On average, his clients’ businesses grow revenue by 18 percent per year. That 18 percent certainly peaked our interest! Isn’t it uncanny how numbers help to focus attention? The financial pulse of the company. The first step in establishing our Scorecard was agreeing about which metrics were the strongest leading indicators. We started by outlining where we want to be in three years. There was good discussion about what we measure and target goals (as quantified with numbers). We’ve made some tweaks now that we’re in flight toward our 2019 targets. Our Scorecard includes 15 metrics (the maximum number Wickman recommends) and is updated weekly. The metrics are shown in green to indicate that they’re on track. Red is used to show when they’re not on track. The metrics also are compared against what we’re aiming for in our three-year vision. While the scorecard is updated weekly, at our monthly management meeting we have a discussion around the numbers. It’s typically a quick review unless we see red. Taking action early, when red becomes a trend, is why the Scorecard is a valuable tool. Having the scorecard updated weekly keeps us all on the same page regarding our financials and critical numbers. But while the numbers typically “speak for themselves,” the story behind them sometimes is key to helping us know if something is just a temporary “blip” or the beginning of a negative trend that needs our attention. When the scorecard is sent out, there are a few paragraphs telling the story behind the numbers. 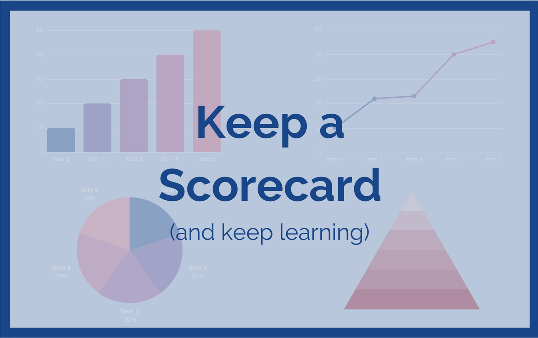 A Scorecard gives you a pulse and the ability to predict. You must inspect what you expect. You can have accountability in a culture that is high trust and healthy. A Scorecard requires hard work, discipline, and consistency to manage, but it’s worth it. One person must own it. We’ve seen positive results from using a Scorecard and we’re committed to continue using it. To learn more about this smart management tool, check out Traction. It’s also a great way to keep learning! Next time I’ll share how Traction helped Intertech improve our meetings. When Tom Salonek wrote his book, The 100: Building Blocks for Business Leadership, I was eager to read it. I’ve long admired Tom’s company and the many awards it has received, not to mention Intertech’s consistent growth and profitability. I run a small business of my own and thought Tom’s book might give me some new ideas. Oh boy, did it ever! If you haven’t read The 100, I highly recommend it. This little book is crammed with practical management strategies that Tom has tested and proven at his company. Not only does the book provide 100 practical mini chapters (Tom calls them “takeaways”), it is sprinkled with fun quotes and Tom’s trademark humor. It’s the perfect book for a short business flight. I should confess that Tom is my cousin, but please don’t think for a minute that this is a gushing “puff piece” based more on familial connections than merit. I’ve known the guy a long time and he’s always been highly motivated, focused and eager to learn and grow, both personally and professionally. He’s a, well, natural born leader. I’ve watched his company (and his family!) expand over time, and seen first-hand the productive and healthy workplace he and his partners have cultivated. The word “mindfulness” is trendy now, but it’s a perfect description of Tom’s approach to business and life. By thinking and acting in deliberate mindful ways based on hard science and life experience, he has built a thriving organization on a solid foundation of values, like delivering beyond what is expected, treating people kindly and fairly, and keeping things in perspective. His book generously shares that experience and practical knowledge in an easy to digest format. It also comes with dozens of downloadable forms and other tools that I’m guessing are worth much more than the modest book price. When I first read The 100 it was still in the galley (pre-print) stage. Like the leader he is, Tom reaches out to others for input and alternative perspectives. I was happy to read the manuscript and give him my honest feedback. And, to be honest, I found it all to be a bit much. There are so many great ideas and recommendations; frankly, I wasn’t sure where to begin or how to implement them at my firm without losing a lot of time in the process. If you’ve read my book, “The 100: Building Blocks for Business Leadership” you know I’ve devoted a fair amount of thought and study to the subject of effective meetings. 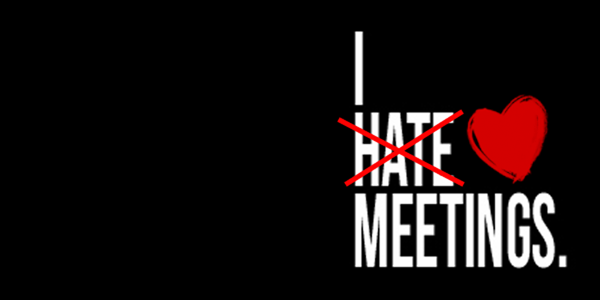 While many people hate meetings, I’ve found that efficiently run meetings are productive and even fun. Just when I thought I had the perfect formula for meeting magic, I ran across a great business leadership book called “Traction,” by Gino Wickman, which expanded my thinking and meeting practices in a number of positive ways. Start with sharing personal items during the “Segue” portion of the meeting, which helps to build personal connections. This is where I ask everyone to share something personal to build personal bonds (like, my kid is having challenges in school, and I’m doing A/B/C to help). The agenda has suggested time allotments for each section. This helps everyone to remember to share meaningful information concisely. In the part of the meeting where people share customer/employee highlights the idea is to get the meeting off on a positive note. I don’t want to ignore problems or issues, which we tackle in the “workout” section, but remembering the positive employee and customer experiences is especially important since our leadership team only meets once per month. Covering the Scorecard (see my previous post for more on Scorecards) and goals/rocks right away without discussion is by design because this section of the meeting just sets the stage for the in-depth discussion to follow. The bulk of the L10 meeting is to discuss ideas/issues. As things come up from one month to the next, I’ll email our office manager, who keeps the agenda, to make sure these items are added to the agenda. This process makes it simple to create the agenda (anyone on the leadership team can add items knowing they’ll be covered at the next meeting). Segue (11:00, 5 Minutes). Each meeting answer one of the following: What’s one good personal and professional thing since the last workout? What’s working at Intertech? What is one highlight from the weekend? What’s the biggest win in the last seven days. Scorecard (11:05, 5 Minutes). Review of financial and operating metrics. Update, not discussion. Rock Review (11:10, 5 Minutes). Review top goals. Update, not discussion. Customer/Employee Headlines (11:15, 5 Minutes). Share positive wins since last meeting. Conclude (12:50, 10 Minutes). Recap To-Do List. What shook out today that needs to be tackled by whom? Cascading messages. What messages need to be communicated company-wide? Next meeting: When’s the next meeting? Rate meeting 1-10 (Should be 8+). Less than 8 merits discussion so we can improve.